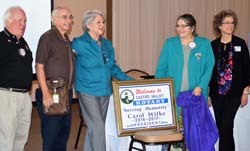 Ben Gurule and other Past Presidents presented President Carol with her “Serving Humanity” sign for the year. President Carol also recognized Suzanne Pershing a “Friend of Castro Valley Rotary” for helping design Breathing for Life Gala flier and Todd Anglin filmed a 'Video Thank You'' from the Club to Suzanne. President Carol thanked Mathilda, Mark, Jim and Heidi for helping out at the Chamber Fall Festival. Rotarians eager to serve at Thanksgiving Dinner at the Kenneth Aitken Senior Center on November 14. All positions requested have been filled. Thank you! All Rotarians who have volunteered for setup and takedown up at the Breathing for Life Gala. There are still spots to fill for takedown on October 23. Contact Carol to volunteer. President Carol reported on the progress for Breathing for Life Gala and Fund Raiser (October 22 at 6:00-10:00 p.m. at Redwood Canyon Golf Course). The flyer is ready to go and all Rotarians will receive emails with instructions for buying tickets on line and making donations. By the time you read this Highlights, you will have received the flier. If you cannot attend the Gala, you will be able to donate to the Fund Raiser. If paying by check, please indicate BREATHING FOR LIFE on the check. Please make sure that your full name and address is on the check to receive a receipt from District 5170 501(c) 3 94- 3016176. Dwight Perry noted that the Club met the Double Sustainer Commitment for The Rotary Foundation (TRF) in the past and is hoping that the Club will do so attend. The Double Sustainer donation is $200. Make the check to The Rotary Foundation, not the Club. 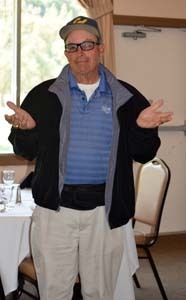 October 4 when the District Governor visits the Club would be an ideal time to make your Double Sustainer donation. Deadline for the TRF raffle for donations is October 21. See Dwight for questions. President Carol welcomed Bob Duey from the Rotary Club of San Leandro, who invited Club members to their Lobster Feed on October 21. Check the Rotary Club of San Leandro website for details. FYI: Bob and his twin brother were members of the last Cal Rose Bowl team. The Club is re-instating the 5-minute craft talks for both new and veteran members. The craft talk is a requirement to earn a Blue Badge. 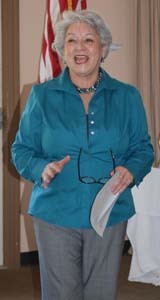 President Carol introduced Todd Anglin of State Farm Insurance, Club Treasurer, for the first craft talk of the year. President-Elect Jim Negri introduced Jennifer Hosterman who is a candidate for the BART Board. She served as was Mayor of Pleasanton from 2004-2012, where she presided over a City budget of over $100M, 465 full time employees and 400+ temporary employees. She sat on many boards and committees including Alameda County Transportation Commission, the Bay Area AQMD and the Cal State Local Government Commission. Jennifer chaired the "Mayors Water Council for the US Conference of Mayors." She live is Pleasanton with her husband, who is Rotarian, and 3 daughters. Jennifer presented her vision for the improvement of BART, which includes upgrading of BART security, parking, new computer and control systems and upgrading the train cars. She supports better labor relations with BART employees as well as BART suppliers and the general public. She favors passage of Prop RR for upgrading BART. Please consider inviting a colleague, friend or family members to hear our speakers.